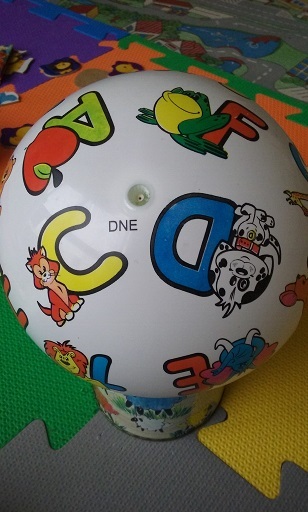 My 1-year kid has a plastic ball that is decorated with all 26 letters from the English alphabet and besides each letter is an image. I suppose the images are of words in English that begin with each of the letters. That works for all of them, except for the Y, which image looks like an axe to me. I searched for synonyms for axe (hatchet, tomahawk) but could not find one that starts with Y. Following is a picture I took from the ball where the Y and it's image can be seen. Y is surrounded by Queen, Nail, Worm, Elephant and Kangaroo, I suppose. The complete list of letter/symbol pairs, for those asking, is Apple, Bear, Cat, Dog, Elephant , Frog, Giraffe, House, Ice, Jet, Kangaroo, Lion, Mouse, Nail, Owl, Pig, Queen, Rainbow, Snail, Tiger, Uboat (submarine), Volcano, Worm, Xylophone, Y / axe, Zebra. And thanks to @jkej's Google sleuthing, another view of the ball may be seen at the site fishpond.com. I bought the ball in a store called Lojas França, located in a mall called Bourbon Shopping Wallig in Porto Alegre, in southern Brazil. The photograph above is page 22 of the Swedish children's book Vill du läsa I ("Would you like to read [vol I]") by painter Elsa Beskow. The J above it is for julgran, the Swedish word for Christmas tree. I checked several thesauruses, like you, as well as Wikipedia's category for axes, and while I found adze, chopper, cleaver, hatchet, mattock, tomahawk, twibill and so on, I found nothing approaching a word with an initial y.
I used OneLook.com's reverse-dictionary functionality to search for "words starting with a y and having a meaning relating to axe"¹ and the only thing suggested was yataghan: "a long Turkish knife with a curved blade having a single edge". An image search tells us that no ball-maker would confuse this sword-like blade for an axe. Going one step further, I checked Wikipedia's comprehensive list of bladed weapons, and from all countries, throughout all history, only 3 start with an initial y: yanmaodao (Chinese), yari (Japanese), and yatagan (Turkish). These are all sword-like weapons, not axe-like, and as mentioned in the previous bullet, of the three, only yatagan has made it into English dictionaries. I used an online tool named Translatr to translate both axe and hatchet into 90+ languages, and cross-checked these with the manual translations on Wiktionary, and literally the only word of those ~200 options which started with a y was Swedish yxa. Cross-checking the translation from Swedish back into English confirmed that Swedish yxa is English axe. 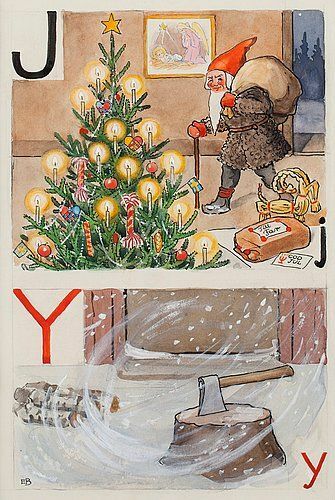 And indeed it is used in Swedish children's primers to illustrate the letter y, as you can see from the children's book excerpt above. As for the other symbols on the ball, we can analyze which letter-symbol pairings make sense in each language. Here I've tagged each pairing with ✅ to indicate "the name a toddler would shout out for the depicted object starts with the corresponding letter", ❌ for "no, it doesn't", and ❓ for "this pairing merits further discussion". In English, the pairings are Apple✅, Bear✅, Cat✅, Dog✅, Elephant✅, Frog✅, Giraffe✅, House✅, Ice✅, Jet✅, Kangaroo✅, Lion✅, Mouse✅, Nail✅, Owl✅, Pig✅, Queen✅, Rainbow✅, Snail✅, Tiger✅, Uboat❓, Volcano✅, Worm✅, Xylophone✅, Y / axe❌, Zebra✅. In Swedish, these correspond to Äpple❌, Björn✅, Katt❌, Hund❌, Elefant✅, Groda❌, Giraff✅, Hus✅, Is✅, Jet✅, Känguru✅, Lejon✅, Mus✅, Spik❓², Uggla❌, Gris❌, Drottning❌, Regnbåge✅, Snigel✅, Tiger✅, Ubåt✅, Vulkan✅, Mask❌³, Xylofon✅, Yxa✅, Zebra✅. 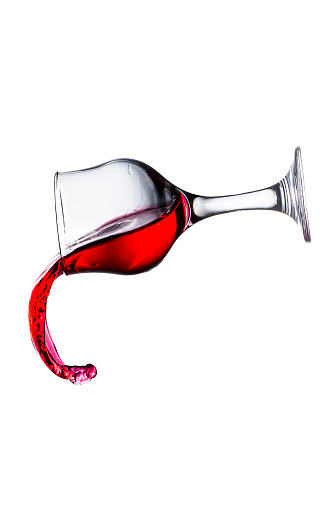 most pairings are sensible in both languages. All told, in Swedish there are 8 words which simply do not fit, not to mention that, as @jkej points out, a Swedish ball would also have to present the letters Å, Ä and Ö, and would possibly choose to omit W. This rules out the possibility that this is a ball made for the Swedish market. For English, on the other hand, outside the mysterious Y, all the pairings use straightforward, non-suspicious common nouns an English-speaking toddler would be familiar with4. Except for one. That U-boat is Swedish-fishy. ... especially how a submarine or “U-boat” picture that got used for the U, given how uncommon a word for a sub that U-boat is in English these days — and to a toddler rather than to a great-grandfather who might actually remember them. Which is evidence against the maker of the ball being completely familiar with English as she is spoke. The submarine could be seen as circumstantial evidence (although not very strong) for some kind of Swedish mix-up explanation. Although U-boat is an English word, it seems a little strange to use it in this context. But in Swedish ubåt is the only word for submarine. 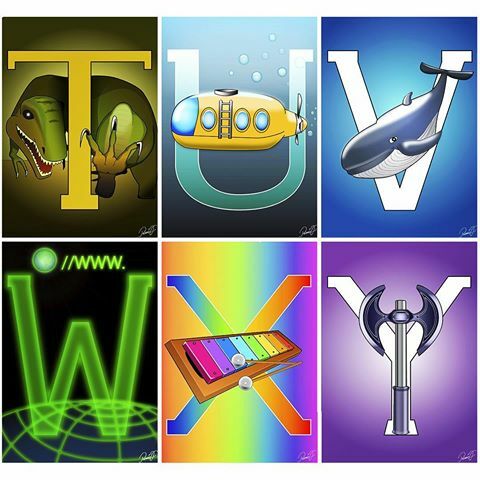 I used Google Image to examine some English alphabet posters and it seemed like almost all of them used umbrella or unicorn for U, but none of them used a U-Boat. Similarly, I found several Swedish alphabet posters with ubåt for U, although uggla (owl) was more common. I can also confirm that yxa was very common for Y. Structurally, Ball, Bounce and Sport Inc. was once a subsidiary of Hedstrom, and through a series of fits and starts in the last century, eventually took ownership of the Hedstrom brand, and now is doing business as Hedstrom. So is the name Hedstrom indicative of Swedish influences on the ball's manufactoring process? BBS owns 98 percent of U.S. and Canadian rubber ball markets and a growing percentage of the rotational molding market. But what about Sweden? I've read several different histories of Hedstrom. The accounts are confusing and at points seemingly contradictory, involving many name changes. Eagle Rubber started making balloons out of a garage in 1916. The company grew and spawned an industry that led to Ashland becoming the balloon capital of the world. The company eventually added lines of plastic play balls. It was bought out by Hedstrom Inc. in 1981, which went bankrupt in 2004. Carl H. Hedstrom, E. Gustaf Hedstrom, Knute W. Hedstrom, Wilfred P. Shuffleton, and Walter Beaman founded the Hedstrom Company, Gardner, Massachusets in 1915. ... The Hedstrom Corporation still exists. Its Bedford plant produces outdoor gym sets, play balls, toys, etc. The Dotham operation is toy focused. Thus the name Hedstrom originates from three Swedes in 1915. The catalog above is dated ~2012, and page 32 lists several of the playballs as new, but not the phonics one, so it's not clear when the ball was first produced. But certainly a century passed between the reason for naming the company Hedstrom and producing the ball. So, with a century and countless mergers, bankruptcies, and restructurings intervening, the Swedish name Hedstrom, while intriguing, cannot be adduced as evidence that the Y stands for yxa. They confirm your ball is not an official Hedstrom A-Z Phonics ball. 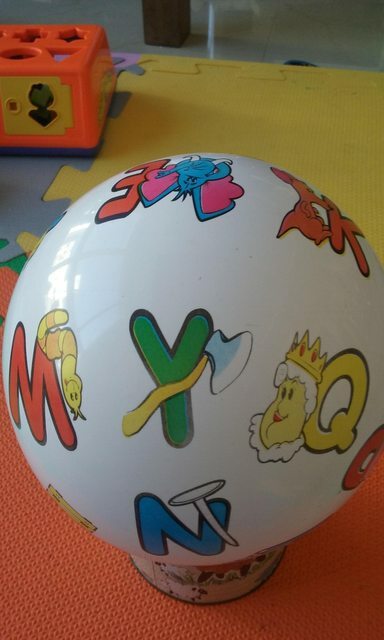 The official ball has a yo-yo for the letter Y. The Hedstrom ball also has a UPC and producer's mark. Further, Hedstrom confirms they do no business internationally (outside Canada, one assumes), and they're not aware of any specific producers who have a known history of copying their designs. Thank you for visiting our website and for your online inquiry about an ABC Playball. Unfortunately, I do not believe this ball was manufactured by Hedstrom. I've attached an image from our QA files of our ball for your reference. Some of the things that tip me off that this is not our ball are the elephant and kangaroo colors. Also, there is considerably more white space on you ball whereas ours has more designs. 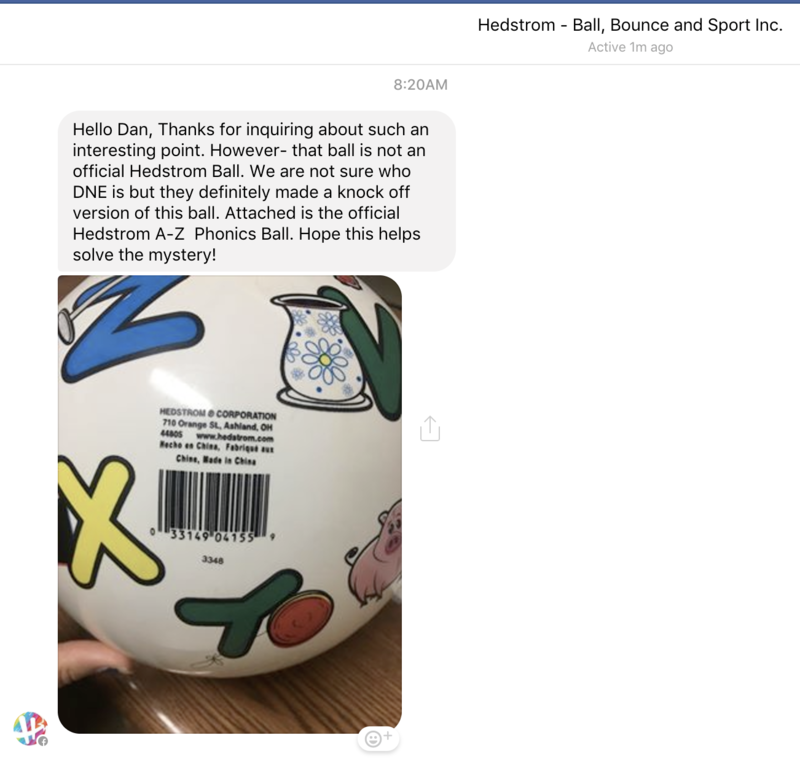 So, just for fun, I visited our samples department hoping to find this ball and I was able to find and inflate a sample of our ball. Our playball has a Yo-Yo for the letter "Y". Another way you can tell is whether or not there is an official Hedstrom legal patch. This patch would contain our name, Hedstrom Corporation, our address, our website, made in China in three different languages, a UPC barcode with the number 0-33149-04155-9 and a four-digit date code. Our inflation valve should be concealed in the Robot "R" picture, too. I'm not sure if your ball has our legal patch or not or where your inflation valve is located, but these are just a few of the way we identify our products. It's probably not impossible for another manufacturer to find and use our designs as these are rather old for us and are not licensed or trademarked. Hope that helps solve the mystery for you. But we are of the opinion that this is a knock off and not an official Hedstrom produced playball. The records that I can still access tell me we created this ball in 2004 and first sold it in 2005. The last one was sold in 2008. Our records don’t indicate ‘who’ might have been the designer at the time. So that trail runs cold. The ball is a knock-off. Let's examine it in more detail for clues. Indeed, additional analysis reveals that your ball and the Hedstrom ball are very similar, but not identical. There are some differences which have to be taken into account. K and E are shared designs between the two images. The neighborhood around K and E are very different, however; in the OP image K and E are adjacent and at each others' "9 o'clock" (E being oriented differently); Q is at K's 6, and Y at K's 7. In the catalog K and E aren't even adjacent; we can see E's entire neighborhood (from 1 to 12: BMDGHL), and K's neighborhood that can be seen is JIDA. So at the very least, if they're the same ball, K and E are repeated, which makes little sense. It's not just that the lay-out is different; look at which part of the letter E is covered by the elephant's ear; that's different too. Note also that in the photo of the ball that Hedstrom sent me, V is used for vase, not volcano, R is for robot, not rainbow, and the drawing of the nail for N is a slightly different style than on your ball. All words that are not sensible in English (i.e. Yxa and U-boat) were absent from the original. All words not sensible in Swedish were present on the original. If (2) holds it is possible that all words added to the knock-off were taken from a Swedish source. Given the pictures of the original that we already have, we only need to confirm that Owl, Queen and Worm were on the original to prove (2). The ‘U’ has a red and white UMBRELLA. 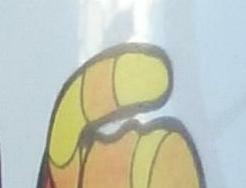 The ‘O’ has a brown and yellow OWL. The ‘Q’ has a QUEEN with white hair and a yellow crown with red & blue jewels. And ‘W’ is an orange and red WORM. I'd like to underscore that I think the answer from Hedstrom was a BIG step forward. It may seem like a dead end, but it conclusively tells us that A) the pictures on the ball came from two distinctly separate sources, B) the general impression of an English ball can be fully explained by one of the sources, C) the pictures from the second source are better explained in Swedish. These were things we could only speculate about before. So a third-party made a knock-off version of the ball, not unusual in Asian manufacture, and introduced these differences, and perhaps picked up some Swedish contagion in the process. To confirm that, we'll have to pick up the scent of this mysterious DNE you found near the valve of your ball. But to do that, we have to start at the other end of the trail. I've reached out to Lojas França via email and Facebook. The email bounced, but there's still hope they'll reply on Facebook. I found the BALL manufacturer!!!! Our suspects! Hiding in China, right where our intelligence said they'd be. And all the other images match as well. Now to track down the manufacturer of these knock-off balls. So while Hedstrom is not responsible for the axe on your ball, there is one last piece of evidence that Y=yxa. We find the ball again on a Swedish user's Pinterest page. In fact, this one of only 3 sites I could find anywhere on the Internet with an image of your ball7. After all this, one thing is certain. Since the original designer of the ball, an American company whose employees are native speakers of English, used yo-yo to illustrate y, we know the intended word is not English. Overall, adulteration of the ball with Swedish words seems indicated, though far from definitive. But it's the best theory I've got. Except of course for @Vincent Fourmond's conclusion that we're dealing here with a yakety axe. ¹ I also tried "and related to": hatchet, chop, and cut, even though the latter two words are verbs and all the other symbols on the child's ball represent concrete nouns. Nothing material emerged. ² We could make a case for N also fitting for Swedish, as @konaya points out, by observing the depicted object could as easily be a tack, which is nubb in Swedish. ³ Note that the E and K which are on the northermost latitude in the photograph have different orientations, and the symbol always has the same orientation as its letter (i.e., the top of the symbol shows you where the top of the letter is) so there is no concern that the W for worm might be M for maggot or anything. 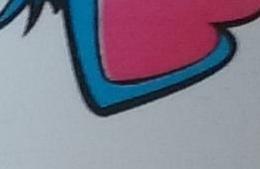 I say this because I wondered for a moment whether the illustrator mistook Y for an upside-down h in hatchet. 4 Which, taken as a holistic pattern, makes the yellow theory very dubious. 5 Since this question was asked, the Fishpond.com product page has been removed, with no redirect. Likely that's due to the the popularity of this question causing many people to hit that page (which listed an out-of-stock item), causing needless load from their perspective. But through shrewd parameter hacking, @biolauri got Google to serve up a cached version. A screenshot is available here, for when the cache inevitably gets flushed and also disappears. With the cached Fishpond.com page in hand, @H Walters did some source snooping and noticed a number of references to the same number as in the Fishpond.com URL: 0033149041559. Many of these references were meta tags and hidden input fields, variously labelled barcode as in <input type="hidden" name="barcode" value="0033149041559" id="barcode" /> or gtin13 as in <meta itemprop='gtin13' content='0033149041559' />. It also exactly matches the code in the catalog (see caption under catalog screenshot; there it is listed in component form Indicator-Company Prefix–Item Reference-Check Digit), and a barcode search confirms the company prefix 0033149 is indeed owned by Ball, Bounce and Sport Inc.
An interesting discrepancy, however. While the Fishpond.com and BBS catalog barcode item reference match (04155), the associated "part numbers" do not. The catalog shows 54-4155: that is, group number 54 (likely "decorated play balls"), species 4155 (same as bar code item reference, less the leading 0). 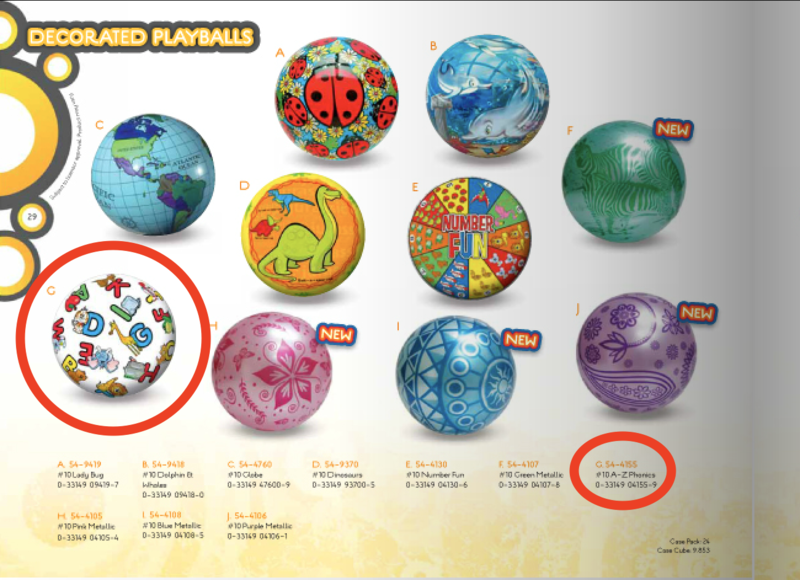 But Fishpond.com shows Other Information: 54-4246T, which is the same group number (54, decorated play balls), but a different species 4246T. 6 And we also know the wholesale price per dozen as of April 2013 was $1.77, thanks to this price sheet (file name "HedstromSpecialtyPriceListApril2013.xls") tracked down by @Mari-Lou's UPC hunting skills. Note that the UPC / barcode is the same as in the catalog, 0-33149-04155-9, but the item number differs. The ~2012 catalog has 54-4155, but the 2013 price list has 54-41554. This may be a typo, or it may be additional substantiation that one UPC may be used for different versions of the product. 7 One potential risk here is that the Pinterest.se page was dynamically generated just for me, based on cookies set during the course of my research into "Swedish" and a young child's toy. Note the Swedish header translates to just a generic a "check out these fine products", and all the products offered are to toys for young children, related to reading, and all the descriptions are in English. But I think the risk here is low: I found the site through a reverse image search on Google, which suggests it pre-existed my research. 鉞 is yuè in pinyin, a romanization of Chinese. 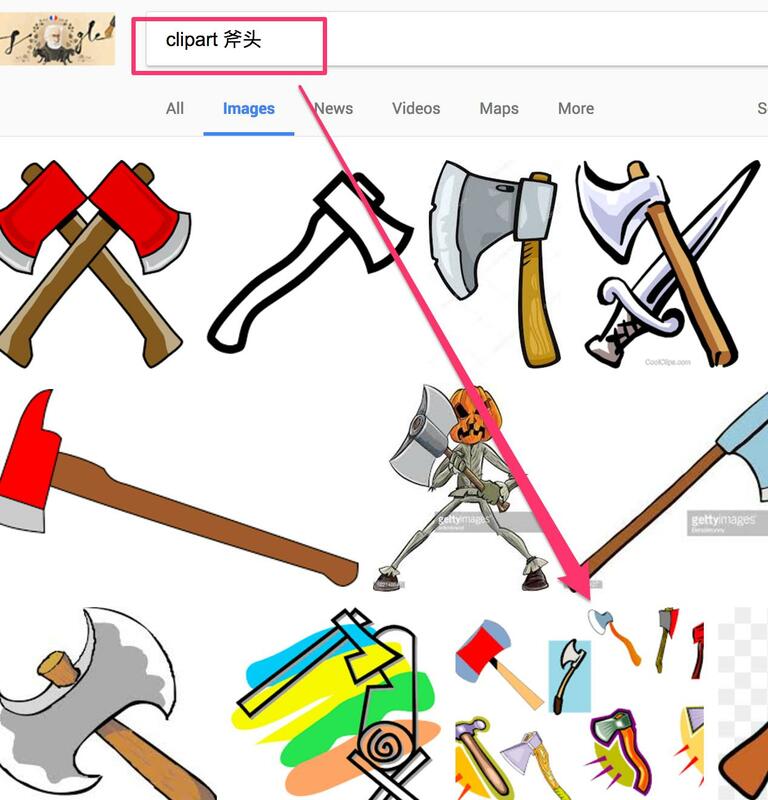 Google image search for the Chinese word. Chinese children learn ABCs but likely before they speak English. So possibly this image was used on another ball designed for Chinese, and was not changed. It is not an axe! As far as we know, there are no exceptions to this. Extremely simply, axes don't have wibbly river-like handles. My deep fear: It's not an axe. As others have pointed out, this was drawn almost certainly in 30 seconds by a commercial illustrator with no knowledge of English or Swedish. for reasons which - tragically - it is extremely unlikely we will ever know, some other illustrator came along, and, decided to add something on the end (possibly - and we can only guess here - not realizing it was meant to be a, we could even say artistic, abstract representation of "yellow swish!") so as it make it more sensible; that person may have thought it was an axe handle, and knowing nothing about English characters just drew on an axe head - or - and here, I'm going to introduce a twist - I really think it may not be an axe head, but rather it was meant to be some other object we can only guess at. Note that an object such as "a brush" or "a paint dispensor of some type" would make ideal sense here. It can be difficult when a bright-eyed, cheerful investigation by - let's face it - rich people with computers and electronic panlingual dictionaries, leads us to not merely a conclusion, but, shall we say, leads us face to face with the incredibly microscopic - but no less powerful for it, far from it - psychological dramas that play out "on the line" of the world of Skyscrapers and Shanties, Lamborghinis and Slums, that is children's ball manufacture, today. Have we even thought ...... what dramas could be found ..... on the other side of the ball? In an office somewhere in Asia. A - Do you know a word that begins with the letter Y? A - Well, do you? B - Do I what? 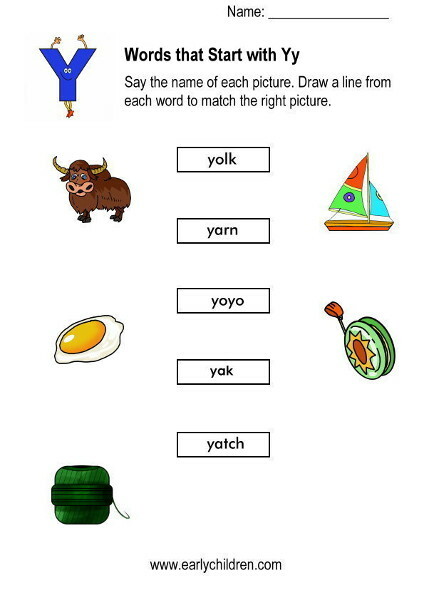 A - Do you know a word beginning with Y? B - What do you need it for? 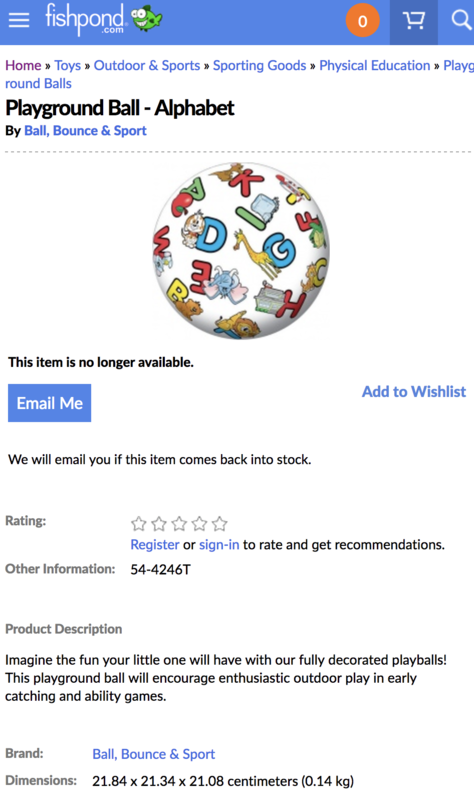 A - Some company from the US with a Swedish name asked me to design a playground ball with phonics printed on it. Can you think of something with Y? A - That's right. But I don't know how to turn yes into a picture. B - Oh, I didn't mean yes, I meant: yes, I know such a word. A - Yuck? That's even harder to picture! B - No yak, that's like an ox. A - Oh, okay, didn't know that. Thanks, it's a good one. B - And yellow of course. Or is it a Yatch? This is the real answer in a nutshell and of course here it is in-depth. I think that the answer is likely to be more simple than most people here are proposing. Given that so much is manufactured in China and that 'Chinglish' is a well known phenomenon (Google it), then I believe the manufacturer has simply got the word for axe wrong. Could it be a Yankee Axe? a term used to describe the lighter weight American style of axe as compared to a European style or Spanish style of axe. Also refers to axes and hatchets that include a flat poll as compared to the rounded European style of axe without any poll. a general pattern of axe developed around the turn of the 19th century that was basically square and without the ears that had previously been included on many axes. Source: Eric Sloane's book "Americana: American Barns and Covered Bridges, Our Vanishing Landscape, and American Yesterdays"
The illustration shows various heads named after various regions of America including one labelled "Yankee". 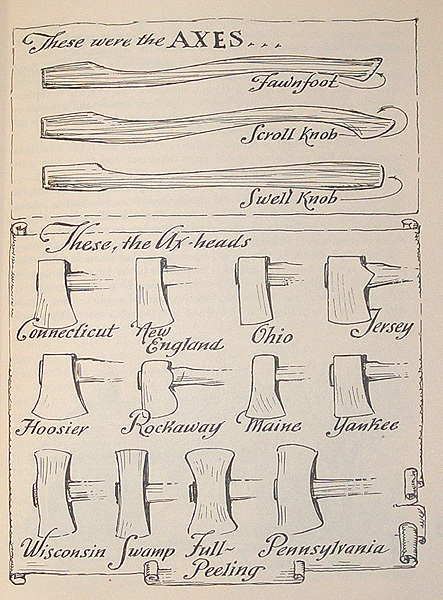 Note that YesterdayTools says that the term "Yankee" was used to refer to American style axes, suggesting that the regional distinction was disregarded outside U.S.A. where all American style axes would be refered as a Yankee axes. What we find if we look at the history of axes, we find that a lot of evolution and specialization tailored to the different types of trees found in each region and the techniques used to process such wood. Part of the problem of focusing attention on the American axe arises from the fact that the earliest ones used here were made in Europe, and certainly the first ones made here were European in character. Thus, in the earliest colonial times a dividing line could not be drawn between the two categories. As a matter of fact, the object was really a European-American axe. Because iron, unlike wood, is similar regardless of the place it was made, the essential substance of an axe does not help to identify its origin. Short of some identifiable maker’s mark, the manufacturers of most of our early axes must remain anonymous. It seems certain that most of the first axes made in North America were made and used on the Atlantic seaboard, a few exceptions occurring when trading companies brought in blacksmiths to their centers of exchange to repair and resharpen axes. As settlers moved westward and southward, their needs were supplied by smiths who went with them and were responsive to individual needs. 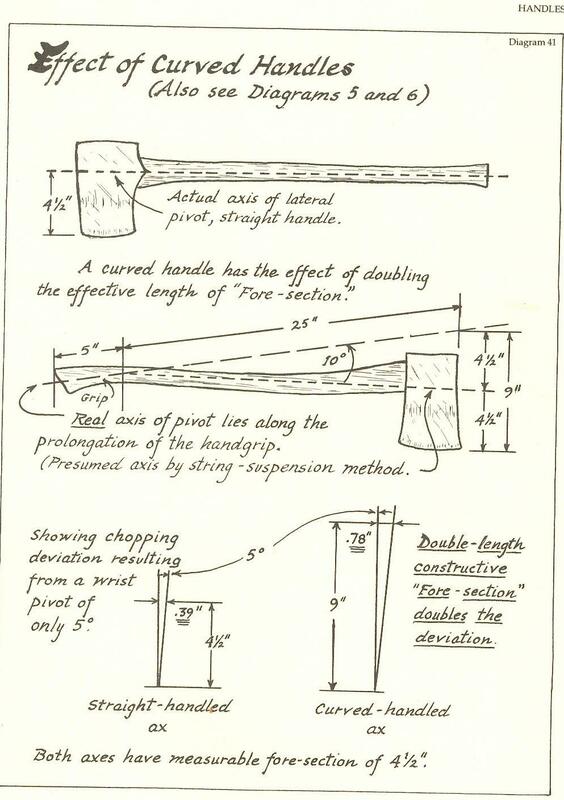 This procedure was the beginning of very high specialization in the forms of axes, a differentiation which was picked up by the big manufacturers in the nineteenth century. The axes were mostly of the felling variety, but there were other purposes for which an axe was needed. The pace of specialization increased; as evidence of this trend, one manufacturer informed the writer that at one time the company manufactured about three hundred different types. The president of the Mann Edge Tool Company, in Lewistown, Pennsylvania, reported that in 1969 they were producing seventy different patterns; however, the bulk of their production involved only about twenty. Addendum: Why would axes have curved handles? A curved handle has the effect of doubling the effective length of the "Fore-section". Real axis of pivot lies along the Prolongation of the handgrip. 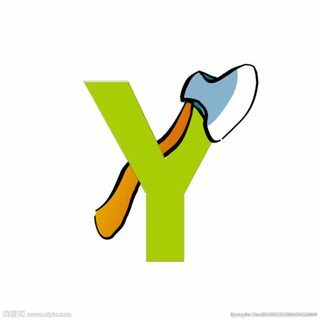 One other possibility, that is actually an English word, is yaxe, a variation of axe/ax1. Most likely E prefixed to Achnach is intended to represent the sound of Y, which is frequently and in different languages prefixed to initial vowels to facilitate the pronunciation, as in the Ayrshire yae, yin, yill, for ac, ane, ale; and Aberdeenshire yaxe, yaik, yirl, for axe, aik, earl. 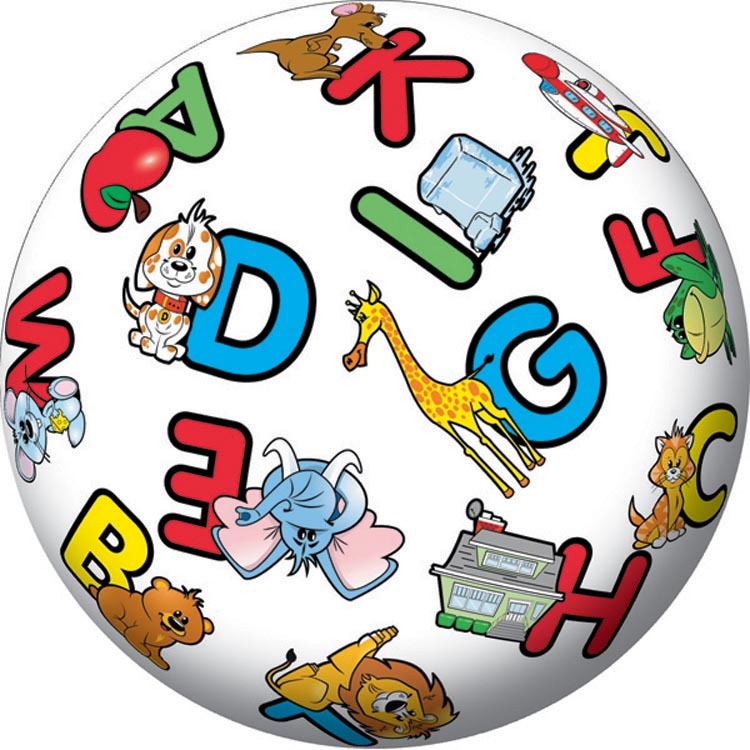 Illustrated alphabets for children originated in the period when this word was apparently in current use (see Wikipedia), so it seems plausible that some Scottish battledore was the model for this ball. Forms: OE acas, äx, eax . . . 15 yax, 18 (Sc.) yaxe . . . .
— "axe | ax, n.1." OED Online. Oxford University Press, June 2017. The OED is behind a paywall; if you don't have access, check with your local library, which may have a subscription. My Process: I found the ball by putting myself in the shoes of the store owner where the original poster bought it. Thanks for everyone adding input and getting it to where it is today...Solved! Not an axe. Not a tube of yellow paint. A spraycan with yellow paint. The graphic artist wasn't aware that it needed to fit in a constrained space. The editor lopped off the can portion of the graphic so that it would fit on the ball... and not obstruct the queen. I think the manufacturer of the ball meant the word yellow, as @Yosef Baskin suggested. As I said in a comment, I scrolled through Etymonline, words beginning with y. This is not as insane as it sounds, because there are not many words beginning with y. I did not find any words in my scan that could be an axe. Then I scanned through my very old copy of Webster's New Collegiate Dictionary (Copyright 1961 by C. & G. Merriam Co.) -- and found yataghan. Yataghan was not in Etymonline. yataghan, also yatagan, (Turk.) A long knife, or short saber, without a crosspiece, common among Mohammedans. But as Dan Bron said, the picture does not look like a long knife or a short saber, and the word would not be in a child's vocabulary. But yataghan is a word in an English dictionary! However, I am convinced that the word is yellow. Addendum (June 30, 2017): I've realized for two or three days that Dan Bron is right. I was wrong. It is yxa. 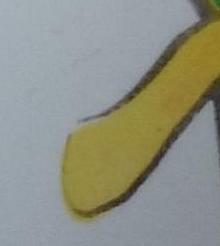 It isn't yellow. I thought about deleting this answer, but am letting it stand as part of the historical record of this historic question. The answer I have is one that I cannot bet on. But it does seem very likely that there has been some confusion on the part of the manufacturer. I saw a video on YouTube that started with: The Y Axes. 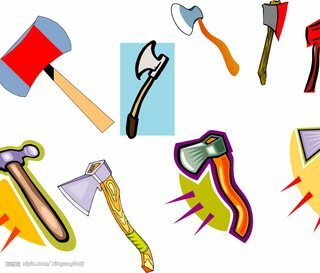 Axes is the only word in English that is used as the plural of three different singular noun forms: 1) ax, 2) axe, and 3) axis. The manufacturer probably saw somewhere the plural form mentioned above and put two and two very strange ones together!! Y and Axe do come together in this weird way! Hope this helps. Working off of thedrake's research, I was able to recreate his Google query. Unfortunately, the only image available through it, is a low resolution version from Google's image cache. I downloaded the low-resolution image and used it in a new Google search by image. This effort led me to a high resolution version. Edit: On the same website, nipic.com, Mary-Lou A found this image. Similar axe, but a different "Y". There have to be a mistake somewhere -- Q-Queen, W-worm, N-Nail pairings make sense, but 'Y' and 'Axe' pair doesn't, because the word Axe doesn't begin with Y.
I think the original design was [X-aXe]. 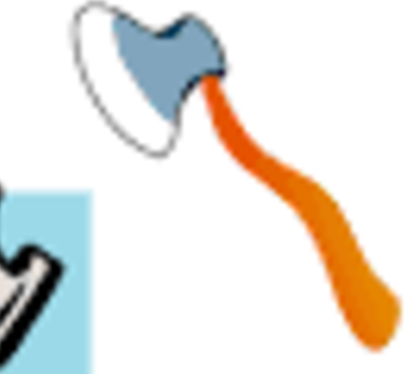 The point of this design was to match an alphabet with an easily remembered common word, thus help children to better remember the English alphabet; since there is no common word begin with the alphabet X, the designer made an exception and paired Axe with X, because the pronunciation of Axe is similar to X. There are two rules in choosing a word to match an alphabet in this design. 1. the word has to begin with the same alphabet. 2. the word has to be common enough for kids to remember. The designer couldn't follow both rules for the alphabet X and decided rule #2 is more important because this is a design for helping kids to remember alphabets. Although the word 'axe' doesn't begin with 'X', but 'axe' does contains 'X' and it is the prominent alphabet in the word. The handle of the axe is supposedly the missing lower left part of the alphabet X, which should be painted green to complete the alphabet. It was either the designer's idea, thinking people would get the idea that the missing part of X was replaced by the axe's handle. Or it was a production error that painted the axe handle with different color. I am a retired graphic designer. 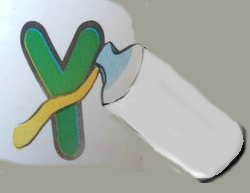 Another connection between the letter Y and axes might be the Epsilon Axe. According to Wikipedia the Epsilon Axe is named after the greek letter epsilon (Ε,ϵ). In some language like German, the latin letter Y is called "Ypsilon", after the greek letter Upsilon (Υ,υ). Other languages like Portuguese also use some variants of that name for both the greek and the modern latin letter. Since Epsilon and Ypsilon sound very similar, it's conceivable that someone accidentally confused Epsilon Axe with Ypsilon Axe, which may got simplified to just an axe in the design. It's a glass pouring yellow colour. My guess is that the maker imagined the verb 'to yield' (as in to yield a sword), and got confused and messed up the sword and the axe? I got to this conclusion after I checked all the verbs with Y and found yield, could this be the case? 1. To chop or fell with or as if with an axe: axed down the saplings; axed out a foothold in the ice. 1. To pull with a quick, strong movement; jerk: yanked the emergency cord. A word that rhymes with Loyalty, begins with L and means or synonymous with greed? What has this tree done, with respect to the fence (picture)?